ROLLING WITH SPRING – Chef’s Diary. I simply cannot get enough of this wonderful time of the year. After a nicely busy off-season, we hit the ground running. Functions, film crews and cycle tours. Classes have become increasingly interesting with spring produce finding its way onto the menu. One class that seems to be requested more and more these days, is ‘Flavours of the East’. One of my personal favourites. It may seem a bit odd for the Karoo, but it Asian inspired dishes using local ingredients makes for an entertaining and novel cooking experience. Oyster sauce ostrich is always popular. 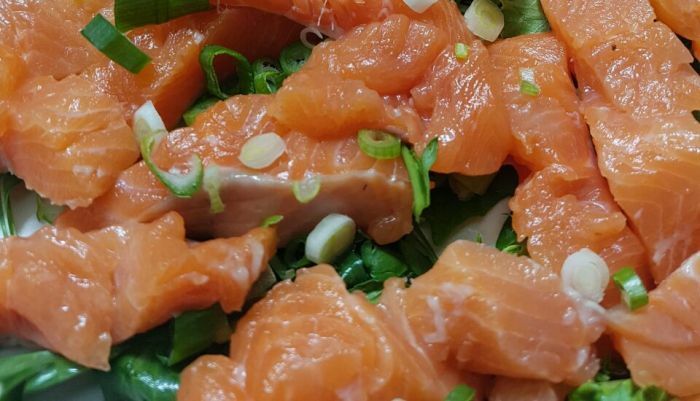 From making your own spring rolls from scratch to filleting trout for sashimi and rolling puff pastry apple roses for the sweet tooth, we explore as many techniques as we can fit in. Apple roses are perfect for catering. They can be eaten by hand and are not too sweet. A great way to use a bushel of apples when you don’t know what to do with them. The apples can be substituted with pears and the apricot jam can be substituted with plum or strawberry jam. For the puff pastry – Cube the butter and rub into the flour keeping it nice and chunky. When the flower is yellow of colour, add water bit by bit until pastry comes together. Form into a rectangle, wrap with cling film and rest in fridge for an hour. Roll out into a 10cm x 30cm rectangle, rolling out and to the side, gently. Fold the bottom to the middle and the top the bottom. Make a quarter turn and roll again same way. Repeat folding, wrap and rest for another 30 minutes. Roll out into a 10cm x 30cm rectangle. Cut into long strips and ladle with apricot jam. 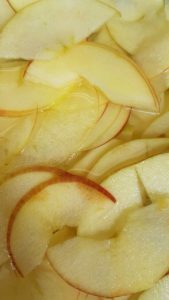 Place apple slices in a bowl with water and lemon juice and soften microwave for 1 minute. Dry, and arrange on strips overlapping the sides. 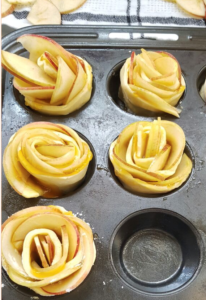 Roll the strips with apple slices forming a rose. Place in a well greased muffin tray and bake at 180 degrees Celsius for 30 minutes until well caramelized and puffed. Remove from muffin tray and place in a dessert bowl. 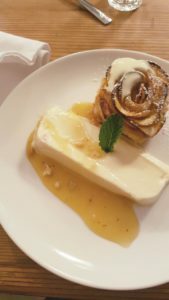 The end product can be served with a nice yoghurt terrine and butterscotch sauce, clotted cream, or just on its own sprinkled with cinnamon and icing sugar. Check out our summer calendar, Anytime or Scheduled courses and join us in the kitchen.